MANILA, Philippines -- Knockout-artist WBA Interim Bantamweight Champion Reymart Gaballo (21-0, 18 KO's) proved to be too fast and destructive for bigger Japanese warrior Yuya Nakamura (9-3-1, 7 KO's), rocking him mercilessly from the getgo, stopping him in two chapters in their non-title clash Saturday (Feb 9) on ESPN5 Philippines. After dropping Nakamura in the first stanza, Gaballo increased the tempo in the following chapter with severe attacks to Japanese's head and mid-section, landing a perfectly-placed right to the chin, followed by a crushing left hook to the liver of Nakamura that propelled the roughed-up Nippon fighter head first to the blue canvas right in his own corner. With unsteady legs and a huge effort, the strong Nakamura somehow made to his feet, but veteran third-man Virgilio Garcia did not take any chances, waiving the fight off right there. Official time of TKO was 1:44 in round two. 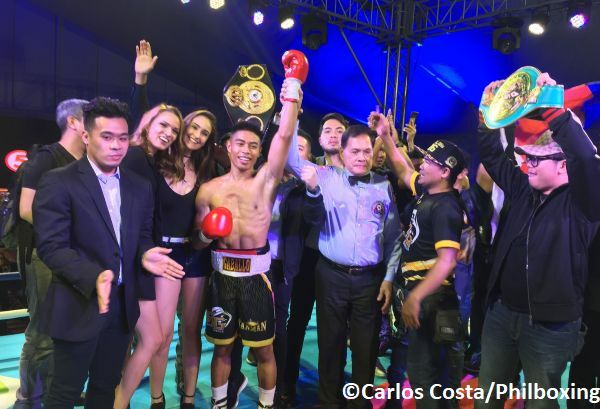 With the win, the unbeaten 22 year-old WBA Interin bantamweight belt-holder Reymart Gaballo reasserts his willingness to battle fellow Filipino WBA Super Champion Nonito Donaire or WBA "regular" titlist Naoya Inoue. "Gaballo is interim champ as well as # 1 mandatory challenger, and we are ready for battle. 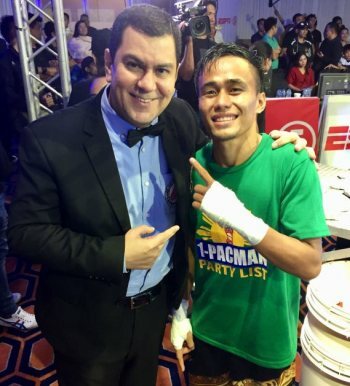 Anytime, anywhere," assured Gaballo's award-winning promoter JC Manangquil of Sanman Boxing." Reymart Gaballo celebrates after stopping Nakamura. In the co-feature, "Ruthless" Romero Duno (19-1, 15 KO's) badly punished Indian fighter Kuldeep Dhanda (7-2, 1 KO) to claim the vacant WBA Asia Lightweight crown. 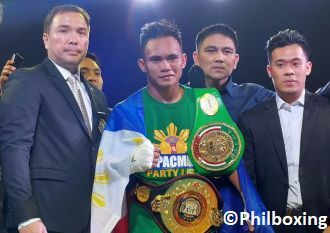 The 23 year-old Duno -- back in his native Philippines after wins in Indio, California, and the Forum in Inglewood -- did not waste a second in landing hard to the head of the brave Dhanda, knocking him down in the opening stanza and rocking him unconscious in the second lap. Dhanda was taken to a nearby hospital for a complete check up, being cleared hours later, thanks goodness. Dhanda lies on he canvas before being rushed to hospital. He was cleared and is alright. 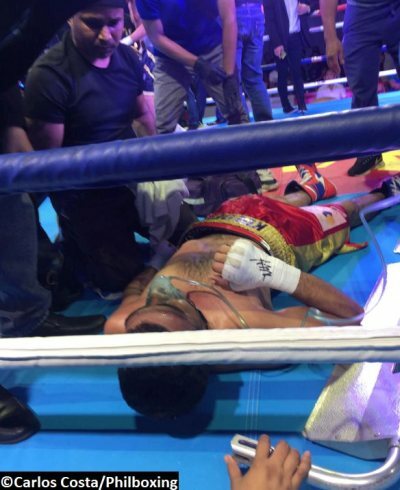 "Kuldeep (Dhanda) got knocked out hard. Got him to hospital. But now he is good," said his coach former fighter Roshan Nathanial. "All is clear. No problem. This is boxing. Indian boxers are strong. Have lion heart." Duno poses with the author. 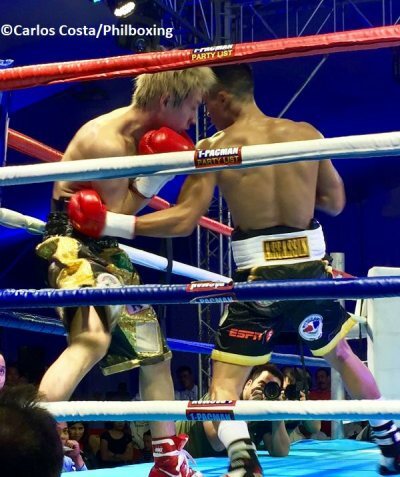 In a well-matched collision, the "Doberman" Dave Apolinario (10-0, 6 KO's) of the Sanman Stable outmaneuvered "The Hammer" Romshane Sarguilla (7-2-2, 4 KO's) for an 8-chapter unanimous decision win in the flyweight division, with both fighters clearly giving their very best effort. However, Apolinario, who comes from a family of boxers, proved to be the more skilled and effective gladiator against a hard-swinging Sarguilla whose fighting approached was rather unrefined and wild. Also, unbeaten Presco "Carjun" Carcosia (4-0-1, 4 KO's) of General Santos City and 7-year-veteran the "Amazing" Renerio Arizala (13-8-3, 5 KO's) of Bacoor, Cavite fought to a draw in their 6-rounder melee in the featherweight division, with all judges scoring 57-57. 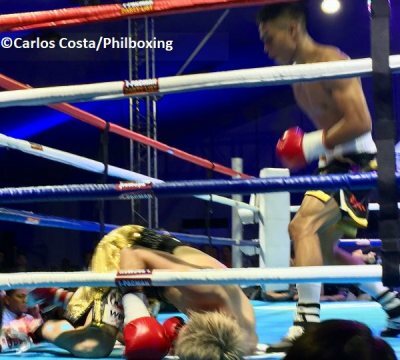 Moreover, undefeated "Iron Fist" Jerven Mama (9-0-1, 5 KO's) of General Santos City scored a unanimous decision victory over tough-as-nails 23 year-old Mervin Lulu (5-5-2, 2 KO's) of the Municipality of Bagumbayan in Sultan Kudarat. In another exciting clash, unbeaten Sanman fighter Rolando "Momoy" Servania (8-0, 3 KO's), brother of world-ranked featherweight Genesis Servania, decisioned veteran southpaw Arnel Caoctoy (6-7-1, 2 KO's) of the seaside city of Ormoc in western Leyte. Their six-stanza duel was in the 122 pound division. Fights were supervised by the Games & Amusement Board (GAB) Chairman Baham Mitra with the assistance of GAB officials Jan Kenner So and Jackie L. Cacho. Timekeeper was the experienced Ralph Dionko, WBA Asia ring officials: Greg Ortega, Ferdinand Estrella and Brembot Dulalas. The exciting Saturday card in Manila for the WBA Asia Title was a production of promoters JC Manangquil and Dexter Tan of Sanman Boxing Promotions in association with the Midas Hotel & Casino, "1Pacman Party List" of Manny Pacquiao, and the support of Lloyd Dennis Manaloto VP and Head of ESPN5 Philippines. The author Carlos Costa is a Panama-born fight reporter living in Cebu. He attended this boxing show in Manila. Carlos can be reached by email carlos512@hotmail.com and whatsapp +639184538152.